The company planning to redevelop two of Victoria's oldest buildings along the Inner Harbour has significantly changed the design of the project once again. 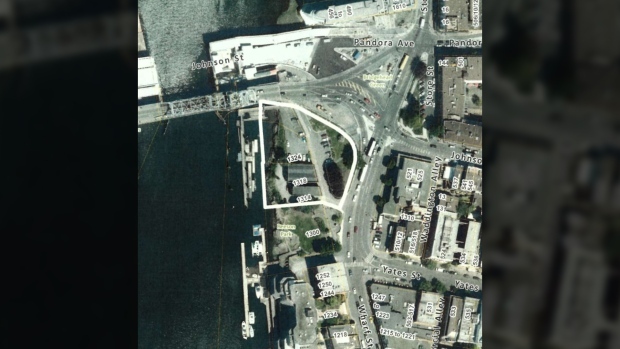 Plans for the long-idle Northern Junk buildings, just south of the Johnson Street Bridge on Wharf Street, have been in limbo for years. The most recent design by Vancouver-based Reliance Properties was to build an eight-storey condominium tower on the land. After downtown residents expressed concerns over the project's height and proposed number of parking spaces, the developer withdrew its presentation from an October 2018 Committee of the Whole meeting. On Tuesday, Reliance confirmed to CTV News that it was considering another significant redesign that would include a focus on rental units instead of condos. The company has discussed the project with Victoria city staff, but hasn't made any official submissions to the city yet. While the developer owns the historic Northern Junk buildings, the city owns much of the surrounding land and has committed to sell off the land subject to a successful proposal by Reliance. Reliance said it expects to submit the redesigned proposal to the city in the next few weeks. The Northern Junk project is considered to be the last piece of the puzzle in a massive transformation of the area surrounding the new Johnson Street Bridge. The new bridge was installed last spring, and the restoration of the historic Janion building on the north side of the bridge was completed in 2016.